Branimir Gjetvaj will share his thoughts on Canadian grasslands and show images from Islands of Grass at 2 pm, Nov. 30, at Mayfair Library. 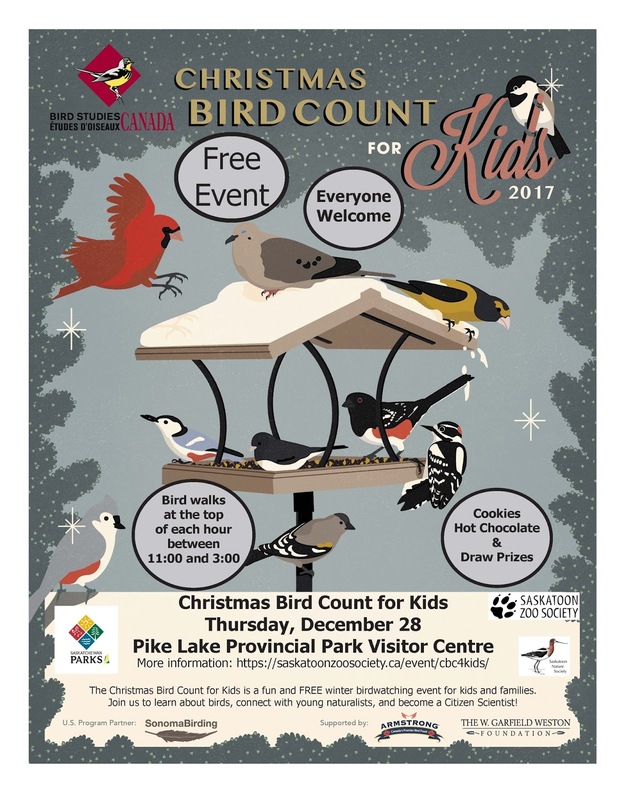 Prince Albert Parkland Permaculture Guild is holding their annual Christmas party on Dec. 1. Jared Clarke’s Grade 6/7 class at Lakeview School is hosting a community climate conversation at 7 pm, Dec. 6. Call 306-791-8513 for further information. A panel discussion on Resource-based Economies & Sustainability: the case of Saskatchewan will be presented at 7 pm, Dec. 6, as part of the University of Regina’s Faculty of Arts’ series. 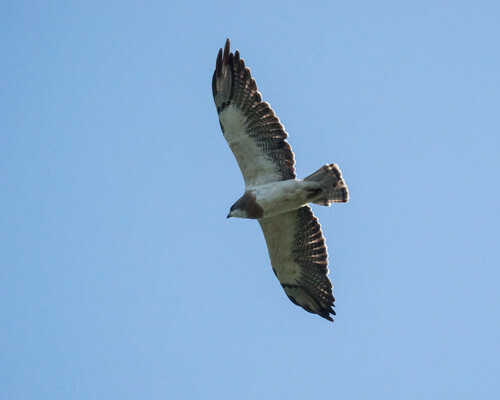 Jeff Keith, SK Conservation Data Centre, will present a webinar on the value and tools available for sharing data on Saskatchewan’s wild species at noon, Dec. 6. Dr. Brett Dolter and Ecofiscal Com, University of Ottawa, will discuss carbon tax in Saskatchewan at the Dec. 6 meeting of the Saskatchewan Energy Management Task Force. Join SaskOutdoors for a winter networking event of outdoor and environmental educators from 7-9 pm, Dec. 7. A former owner of the Nature Conservancy’s Messier property planted spruce trees, but they’re not native to this area and their presence could have a negative impact on the native habitat. You’re invited to come and chop down your own Christmas tree from 1-3 pm, Dec. 9. 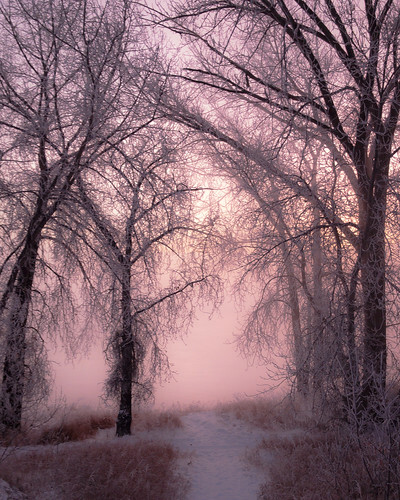 Nature Regina is holding a Christmas Social with members’ photos at 7 pm, Dec. 11. 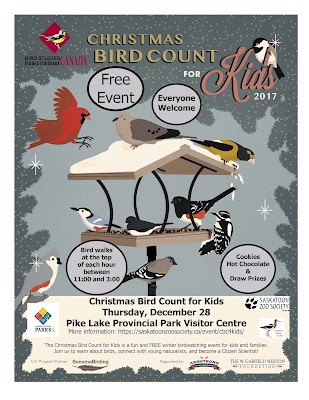 Bring the family to Wascana Marsh from 2-4 pm, Dec. 16, for a Family Play Day organized by SaskOutdoors. The Saskatchewan Environmental Society is offering a one-day workshop on Feb. 2 in Saskatoon for small businesses that would like to make their buildings more energy-efficient. The theme of this year’s Native Prairie Restoration & Reclamation Workshop, Feb. 7 & 8 in Saskatoon, is Look to the Future: Learn from the Past. 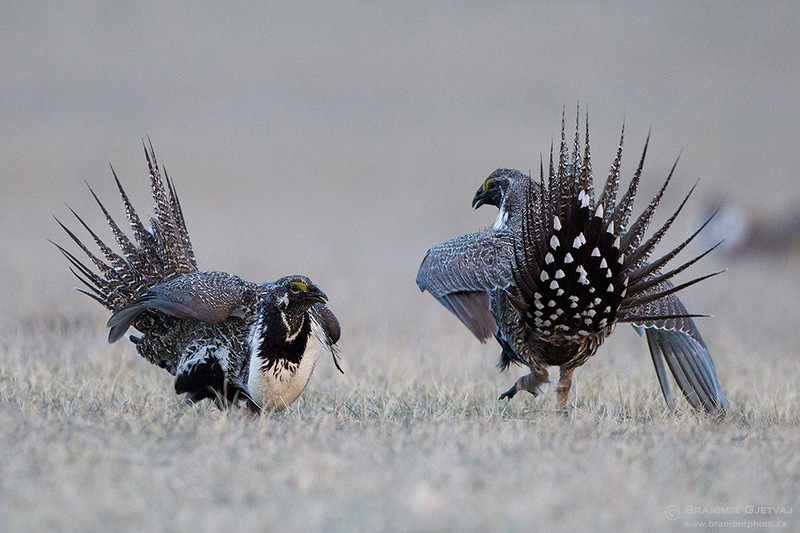 The Transboundary Grasslands Workshop, featuring presentations on challenges facing wildlife and human communities in the grasslands of Alberta, Saskatchewan, and Montana, will be held Feb. 13-15 in Glasgow, Montana. The Saskatoon Nature Society is now taking applications for their Kids in Nature Grant. 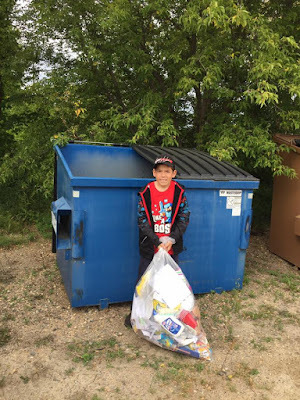 The grant was established to strengthen existing programs and encourage new initiatives that connect youth in the Saskatoon area with nature. The application deadline is December 31, 2017. Information and applications are available on the Saskatoon Nature Society website. Glitter has a devastating impact on human and non-human animals alike. 50M tonnes of e-waste! We need better systems for recycling electronics. The challenge of EnergieSprong is to retrofit ordinary homes to the standard of a zero-carbon eco-home, but at a fraction of the cost. Canmore community members are passionate about protecting the space and habitat wildlife require. Dr. Branimir Gjetvaj is a biologist, internationally published environmental photographer, and president of Nature Saskatchewan. 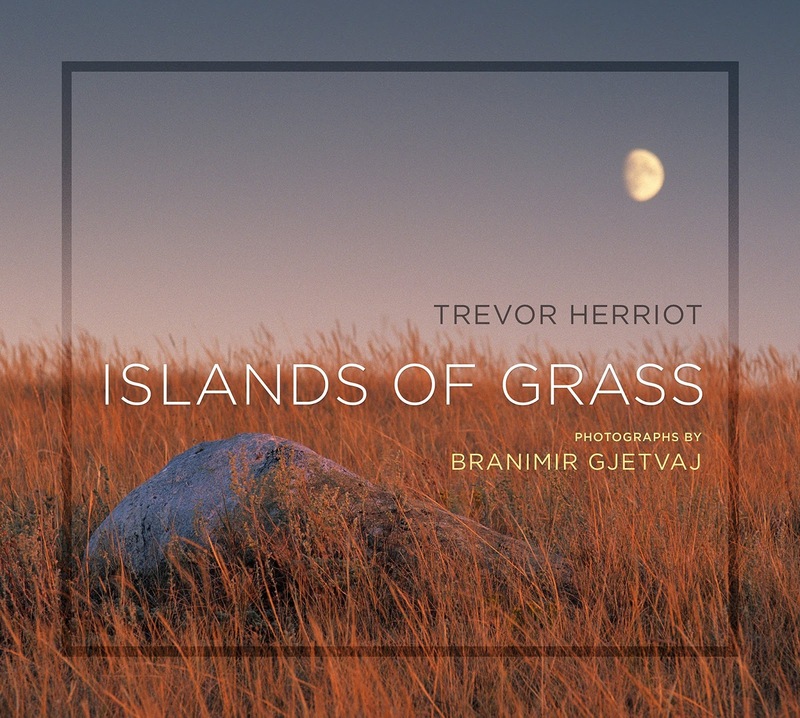 He and Trevor Herriot recently published Islands of Grass, sharing the wonder and importance of Saskatchewan’s grasslands. Branimir grew up in Croatia and has fond memories of hiking and skiing in the mountains with his parents. There was a ravine close to his home in Zagreb with a little stream, grassy slopes, and trees. As a child, he would explore this jungle, jumping from tree to tree like Tarzan. “I would immerse myself in it. It was my whole world,” he says. Branimir joined his high school’s photography club, taking black and white photographs using the school darkroom. A trip to England when he was 16 or 17 motivated him to start taking lots of photographs as a way to record his memories. 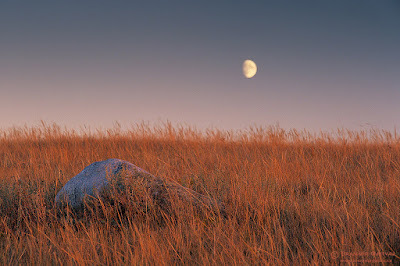 Photography was again a tool for exploring and experiencing new surroundings when Branimir moved to Nova Scotia as a Master’s student 30 years ago. Branimir’s interest in nature photography was stimulated by university lectures by Vladimir Pfeifer, a Croatian nature and wildlife photographer. With limited equipment at first, it was tricky to take photographs of wild animals. However, over time, Branimir developed his skills, learning by trial and error, studying books of other people’s photographs, and looking to painters for inspiration. 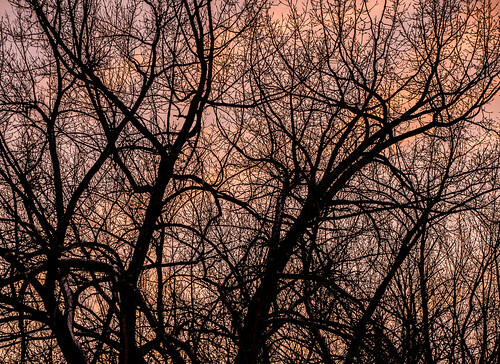 When taking photographs, Branimir likes to focus on a particular project. 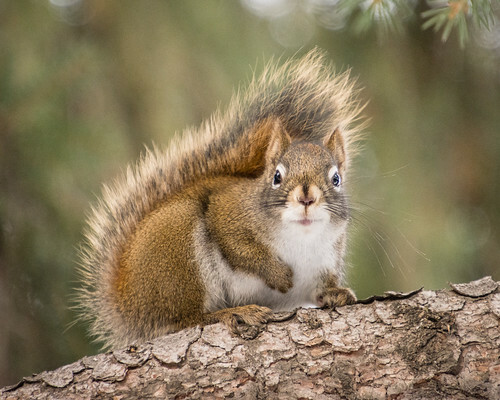 A decision to document biodiversity hotspots in Saskatchewan led to a series of photographs of Nature Conservancy of Canada’s Saskatchewan properties when they were celebrating their 50th anniversary as well as participation in Meet Your Neighbours. An interest in the Great Sand Hills led to the publication of his first book, The Great Sand Hills: A Prairie Oasis. When the federal government started to dismantle the PFRA community pastures system in 2012, Branimir decided to take photographs of the pastures and the ranching way of life linked to them, and he approached Trevor Herriot to see if he’d be interested in working on a book. As the project got underway, the two men expanded their focus to Canadian grasslands as a whole and did a lot of fieldwork together in 2015. Islands of Grass required a great deal of effort. The fieldwork was carried out over an extended period of time, but processing the photographs was intense. Branimir spent 5-6 hours a day for 4-5 weeks processing the images and preparing them for the press until he was happy with the way they turned out. Both Branimir and Trevor are offering presentations concerning Islands of Grass. You’ll find the dates listed on their websites as well as on the EcoFriendly Sask Calendar. 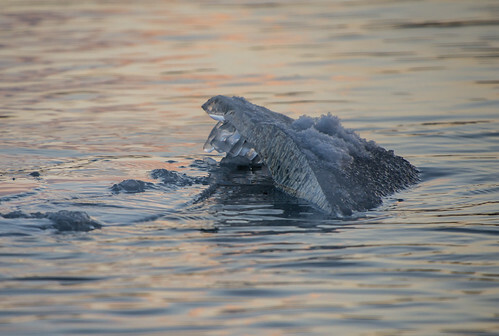 Want to be a conservation photographer? If you’re interested in developing and using your nature photography skills for a greater good, Branimir suggests working with local conservation organizations that are always in need of good-quality photographs. “Conservation photography doesn’t pay well,” Branimir says, “but amateur photographers can play a valuable role by working with local organizations in motivating people to go out and experience nature and by supporting particular projects.” Branimir says there’s no money in it but lots of personal satisfaction. You’ll have easier access to the sites and support from the NGOs. Branimir has been inspired by the work of many conservation photographers, most notably Michael Forsberg, Carlton Ward, and Eliot Porter. The Prince Albert Food Coalition is holding a Fall Food Fair from 5:30-7:30 pm, Nov. 22. Renny Grilz, Meewasin Valley Authority, will discuss Enhancing Grassland Bird Habitat & Biodiversity at the Northeast Swale as part of the WildEcol seminar series at the University of Saskatchewan at 3:30 pm, Nov. 22. The University of Regina’s Science Pub series is offering a talk, Not Just Flat: Top Geological Sites of Saskatchewan, from 5-7 pm, Nov. 23. 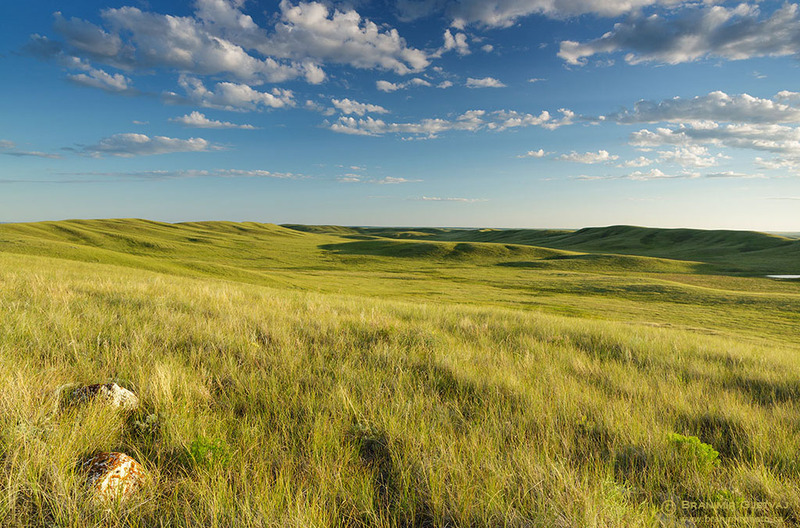 Nature Conservancy of Canada is presenting a panel discussion on Why Grasslands Matter at 7 pm, Nov. 23, in Regina. Everyone is welcome at the upcoming meeting of Walking Saskatoon from 1-3 pm, Nov. 26. 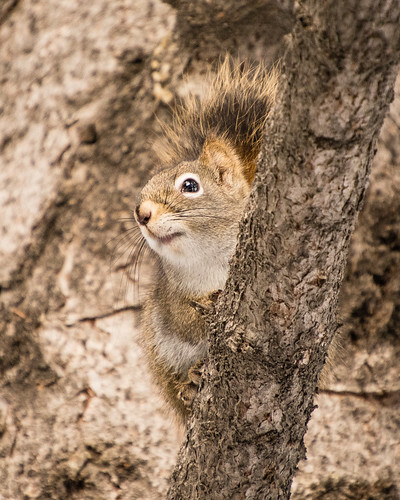 Moose Jaw Nature Society will be meeting on Nov. 27 at 6:30 pm to make ornaments and decorate a tree for wildlife. Check out the recipes and ideas on their Facebook page. 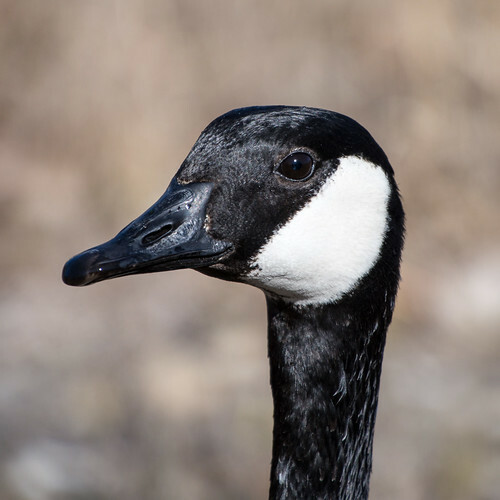 Nature Canada is hosting a webinar panel to discuss interdependencies and the need for global governance systems to protect critical habitats and migratory paths from 10-11:30 am PST, Nov. 28. Rick Huziak will discuss what stands in the way of eliminating light pollution at the 7:30 pm, Nov. 28, meeting of Café Scientific. Permaculture Regina is screening the documentary, Cultivating Calgary’s Local Food Resiliency followed by a discussion about local food production at 7 pm, Nov. 29. ENGIE Canada Inc. is holding an open house from 4-8 pm, Nov. 29, in the Chinook Golf Course restaurant to solicit feedback on their plans for the Wymark Wind Project, 25 km southeast of Swift Current. ENGIE Canada Inc. is holding an open house from 4-8 pm, Nov. 30, in the Gull Lake Community Hall to solicit feedback on their plans for the Benchlands Wind Project, 80 km southwest of Swift Current. Join Lesley Sampson of Coyote Watch Canada for a webinar on co-existence programs, community buy-in, and what can lead to success or failure for co-flourishing with coyotes. The Native Plant Society of Saskatchewan will hold their annual general meeting and conference in Regina, Jan. 27 & 28. This year’s theme is A Prairie Patchwork: Selected Topics on Native Prairie and keynote speakers are Branimir Gjetvaj and Trevor Herriot. The Prairie Ecosystems learning module of the Saskatchewan Master Naturalist program is scheduled for Jan. 28. Let’s give this road to the birds. “H. sapiens depends utterly on a rich diversity of life-forms to provide various life-support functions essential to the existence and continued survival of human civilization.” Accelerating biodiversity loss poses as big a threat as climate change. 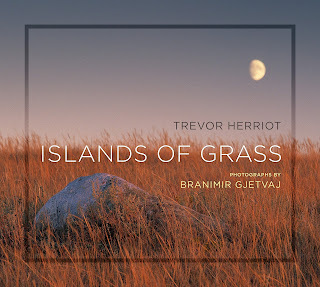 Islands of Grass by Branimir Gjetvaj and Trevor Herriot will be launched Nov. 14 and 15 in Regina and Saskatoon respectively. Trevor Herriot will be speaking at a number of additional events on Nov. 16, Nov. 18, and Nov. 20. Both Branimir and Trevor will be presenting at McNally Robinson Booksellers in Saskatoon on Nov. 21. Check the EcoFriendly Sask Calendar for full details. The online Disruptive Innovation Festival, Nov. 6-24, asks what if we could re-design everything. Topics include the circular economy, regenerative agriculture, using fungus to destroy plastic waste, and much more. A panel discussion, Should a Carbon Tax be Part of the Plan to Combat Global Warming, will be held from 2:30-4 pm, Nov. 17, at the University of Regina. Ryan McKellar will talk about his research on insects and other fossils trapped in amber at the Nov. 20 meeting of Nature Regina. The Royal Astronomical Society, Saskatoon Centre, is holding a general meeting from 8-9:30 pm, Nov. 20. Hayley Carlson, and Rachel Malenachan will discuss Let’s Talk Climate Change: How to Build Bridges in Saskatoon at 7 pm, Nov. 21, as part of the SES/Public Library Sustainable Speaker Series. Join PCAP-SK for breakfast and a presentation on Burrowing Owls: A Symbol of Conservation in Saskatchewan from 8-9 am, Nov. 23, at Agribition. Jared Clarke will discuss his summer of banding hummingbirds at the Fort Qu’Appelle Nature Society meeting at the train station from 7-9 pm, Nov. 25. Nature Saskatchewan is holding a free Conservation Awareness & Appreciation Supper in Glentworth on Nov. 29. The Saskatchewan Environmental Society is offering a one-day workshop on Dec. 1 in Prince Albert for small businesses that would like to make their building more energy-efficient. 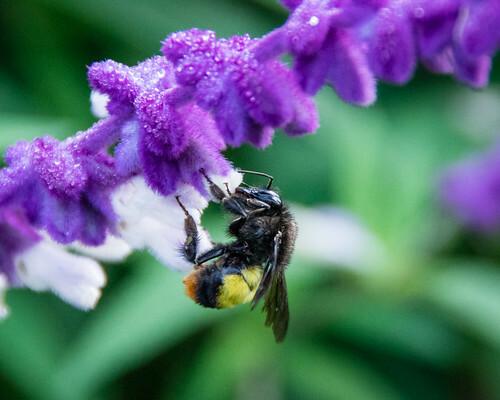 The UK will back a total ban on neonicotinoids. If only Canada would do the same as neonics have been found to harm songbirds as well as bees. 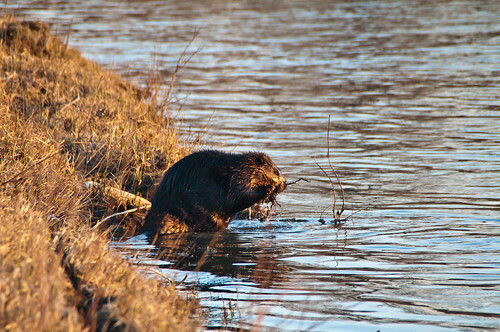 Rural Saskatchewan municipalities are concerned about a growing beaver population. Let’s hope they turn to The Fur Bearers for help in finding non-lethal solutions. "Degrowth means embracing sufficiency for all, rather than excess for a few, and culturally, it means imagining a good life beyond consumerism." Art can help the degrowth movement in 3 ways: through story, myth, and narrative; engaging the heart as much as the head; and presenting information in an attractive, compelling way. It’s a challenge to stay on top of all the upcoming events across Saskatchewan. Here are a few that we missed yesterday - but don’t want you to miss this week! Yellowhead Flyway Birding Trail is holding a general meeting tonight, Nov. 8, at 7 pm, in the Stirling Room, Saltcoats. Dr. Jeremy Pittman, University of Waterloo, will discuss Environmental Planning and Policy for Connectivity in Human-Dominated Landscapes from 2:30-3:30 pm, Nov. 10, at the University of Regina. Green Drinks Saskatoon is meeting at 5:30 pm, Nov. 10, at Cathedral Social Hall. Find out more about volunteering with the Wildlife Rehabilitation Society of Saskatchewan from 12-1:30 pm, Nov. 12, in Saskatoon. And, because there are always interesting news stories, here are a few that caught our attention in the last 24 hours. "It’s easy to dismiss grasslands as unimportant when you only see them as wastelands of grass that stand between you and the mountains or forests you really want to see. It’s harder to dismiss them once you’ve gotten to know them a little better." Toronto Council votes to make the Bloor Street bike lanes permanent. How long do you expect/hope your washing machine or refrigerator will last? The United Nations reports on measures that could extend product lifetimes and reduce waste. 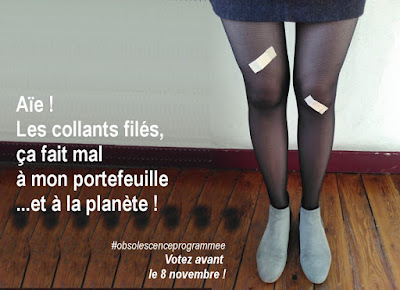 A European organization that advocates an end to planned obsolescence is running a campaign protesting the extremely short life of pantyhose. Enjoy songs inspired by Last Mountain Lake National Wildlife Area at 7 pm, Nov. 9, at the Royal Saskatchewan Museum. The Elixir Ensemble, with Margaret Wilson, clarinetist, will perform the Quartet for the End of Time at 2:30 pm, Nov. 12. This piece of music was the first attempt to compose music based on an analysis and adaptation of the structure and rhythms of birdsong. Saskatoon Cycles is holding their annual general meeting from 7-9 pm, Nov. 15. Michael Pollock, Saskatoon Water Security Agency, will discuss the responses of birds and other vertebrates to changing water levels and relate these to balancing the needs of wildlife, including endangered species, with the needs of farmers and municipalities at risk of flooding at the Nov. 16 meeting of the Saskatoon Nature Society. You can dispose of household hazardous waste in Saskatoon from 9 am–3:30 pm, Nov. 18. Join SaskOutdoors for an all-ages-friendly event exploring the boreal forest in the in-between season and meet a yard full of puppies at Sundog Excursions on Nov. 19. Passive House Design and Construction, a four-day course covering the technical, economic, and policy elements of Passive House buildings, is being offered in Saskatoon from Nov. 23-26. Elizabeth May discusses successful political policies and actions for going green on Defender Radio. Mountaineers discuss the impacts of climate change on mountain communities. If you find a bat in your home or office, call the WRSOS hotline. Or, if you’re in Regina, the Saskatchewan Science Centre will give them a cozy home for the winter. “The breadth and depth of the climate change issue is such that no one policy instrument is sufficient to meet Canada’s 2030 GHG reduction target. 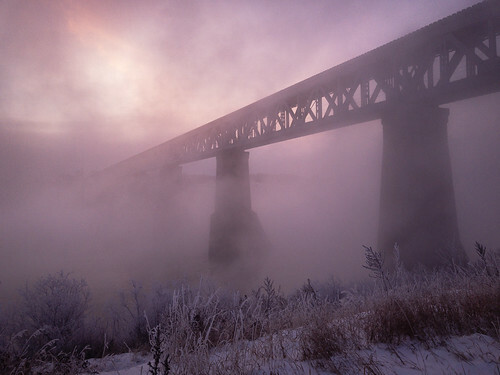 There is no magic bullet,” said Dale Eisler, co-author of a new report on climate change in Saskatchewan. Urbanization is reshaping and creating new species of microbes, plants, and animals. Rethinking agriculture: Is it possible to use crops with lower water needs without affecting the level of production? Biofuels from agricultural waste instead of food crops are finally reaching the market. Walking is a man’s best medicine, Hippocrates declared. The 2017 Walking Summit outlined problems for pedestrians but also highlighted communities that are getting it right. Climate change lawsuits: Global warming is increasingly being fought in the courtroom. 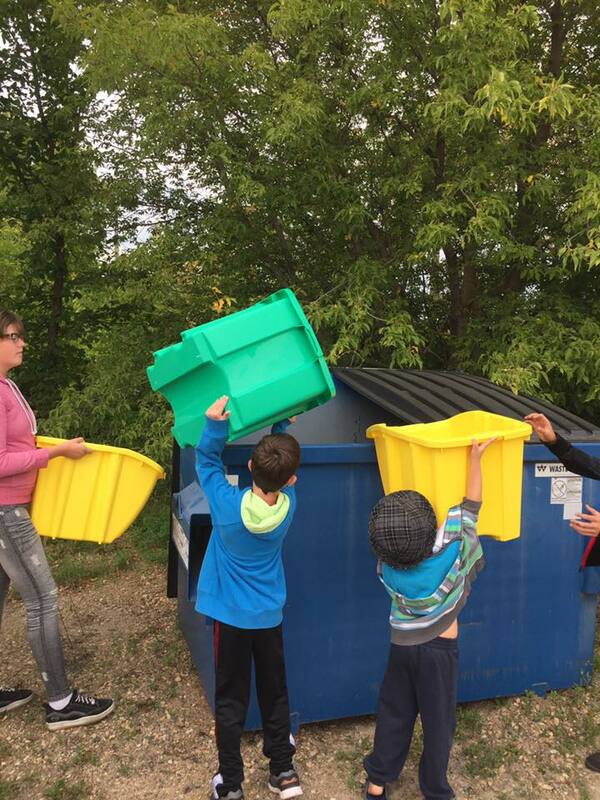 A school, a youth club, and a community are doing their best to reduce waste in Saskatchewan, with a little help from an EcoFriendly Action Grant. 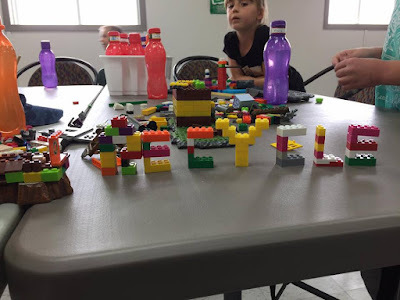 The staff at the Boys & Girls Club of Yorkton are passionate about making a difference and in fostering that passion in children and youth as they grow. With over 15,000 visits to the club each year, Program Manager Erin Roussin saw an opportunity to incorporate environmental education into their summer program, which includes week-long day camps for 5-12 year olds and drop-in evening programs for middle-years youth and teens. Talks about topics such as reducing water usage, recycling, and the impact we can all have on our environment. There's no waste in this lunch bag! Blaine Lake Composite School is initiating a daily full breakfast program. In order to reduce waste, they received a $500 EcoFriendly Action Grant to purchase non-disposable cutlery and an environmentally friendly dishwasher. They plan to minimize food waste and environmental impact through careful meal planning with the students in their Commercial Cooking classes, by sourcing local ingredients whenever possible, and by only using reusable dishes and utensils. They will recycle all applicable materials. Odessa is a small community of 250 people southeast of Regina. They were already recycling paper, but their active volunteer base identified a need for additional recycling bins so that they could recycle cans and plastic as well. 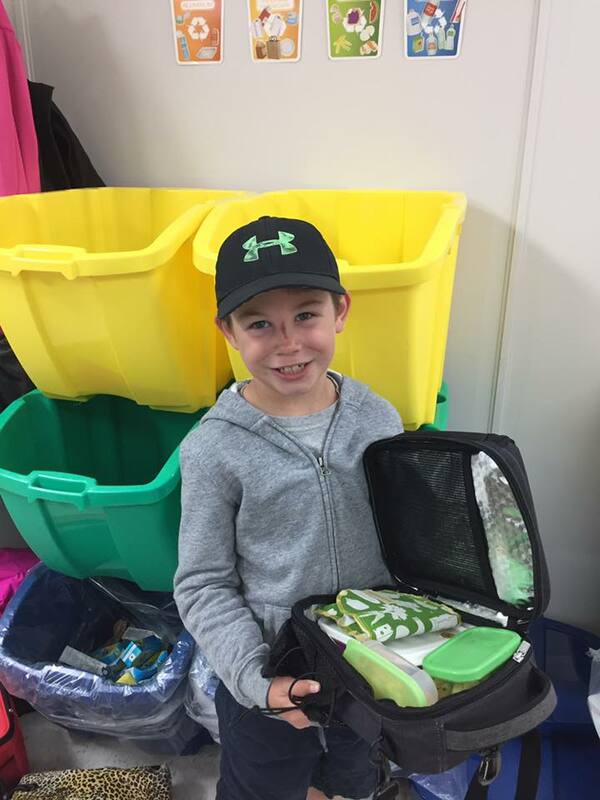 The Odessa Recreation Association received a $500 EcoFriendly Action grant to purchase recycling bins. They’ll be located at the rink during the winter and will be moved to the community centre in the summer. They’ll also be made available at the annual truck and tractor pull, which is a community fundraiser.